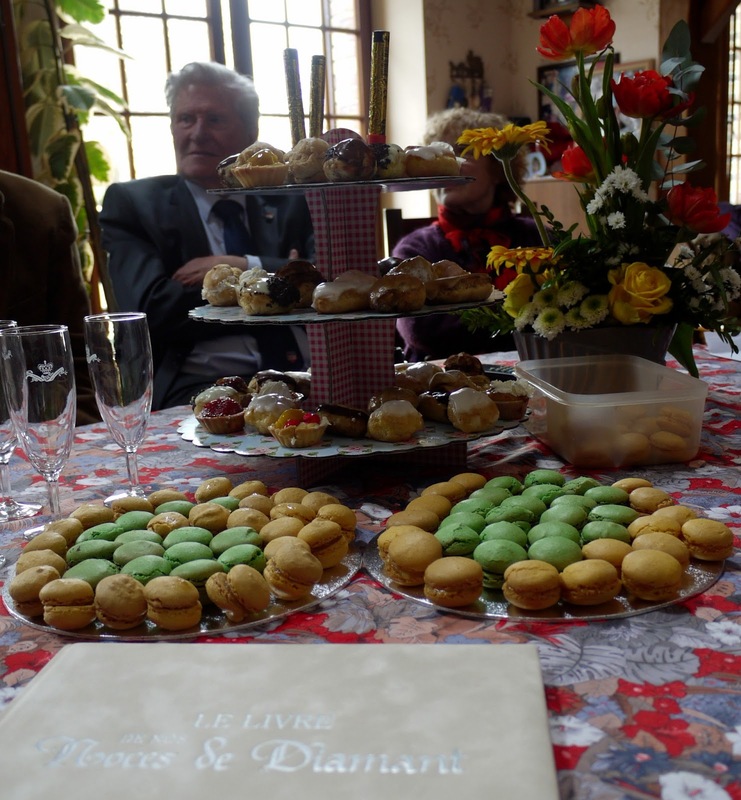 Sixty years ago, Marcel married Colette, and last weekend they celebrated again in the Hotel de Ville of Saint Valerien just outside Sens. I would like more days like this. 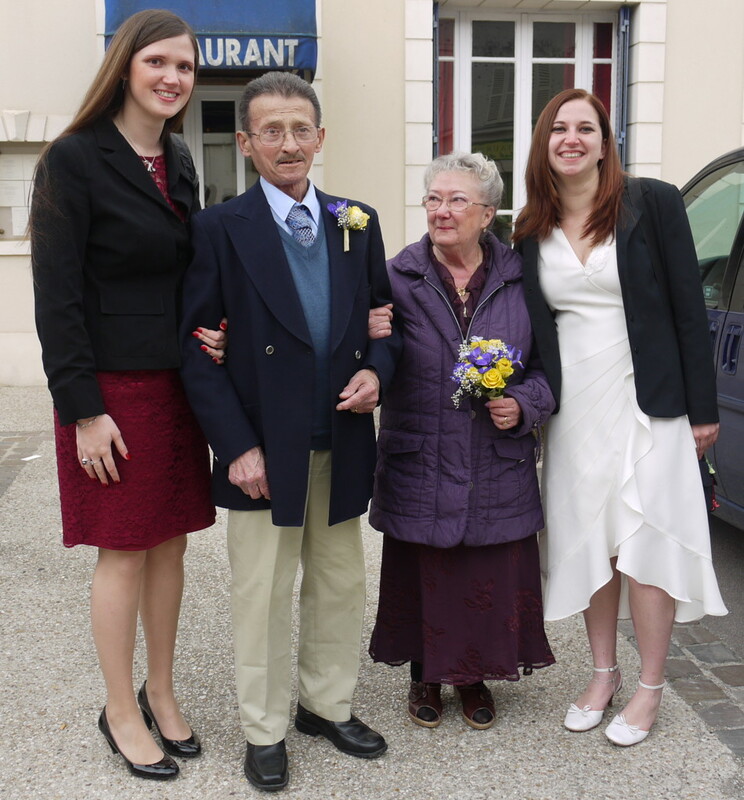 Congratulations to Marcel and Colette and congratulations to Hodmandod Majorette for organising such a great and memorable day. 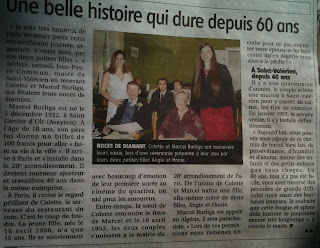 It must have been a lot of work - but a big success! ...and still they kept coming. 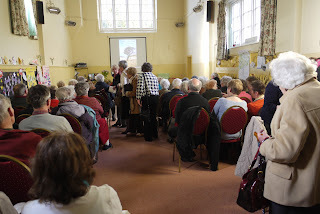 Eventually they had to get more chairs down from the loft. 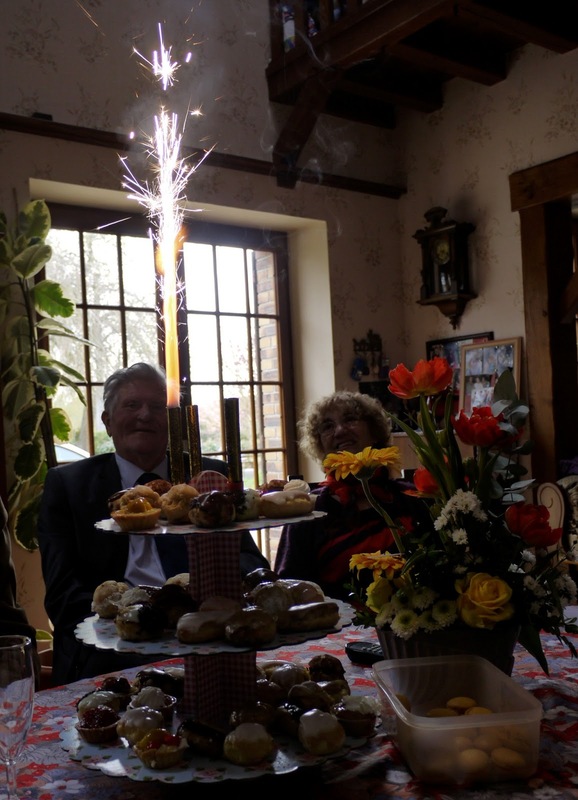 I think it was the enticement of Welsh Cakes and Bara Brith that did it ....and Joan and Don Bartholemew's excellent publicity efforts. Many thanks to Joan and Don, Paul who organised the electronics and the many people who helped with the chairs and cakes. 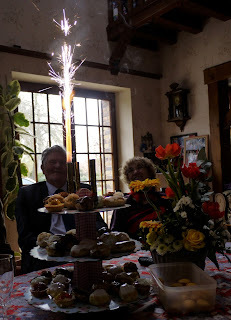 I had a great evening. 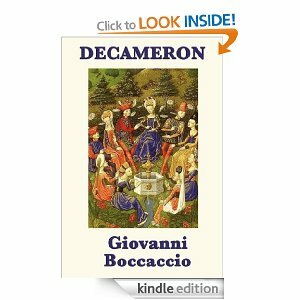 To finish my study of the Black Death, I have been reading stories from the Decameron by Giovanni Boccaccio. The stories take place during the initial onset of the Plague in Florence, and a group of upper class ladies and gents escape to a the countryside and tell each other stories. There are ten stories a night over ten nights - and range from the simple and very short to more complex plots. I learnt a lot about the social life of this sort of class of people. The Medieval Manorial system still holds sway, and at one stage the knightly skills of horse riding and falconry are mentioned. They have proved to be very entertaining, and remind me a little of some of the lighter plays of Shakespeare, concerning gender mix-ups, trickery, the dishonesty of the church, and the lusts of various abbots and monks. In fact I would say all of the stories involve the matching of male and female - hardly surprising, I guess, given the age of the story-teller. 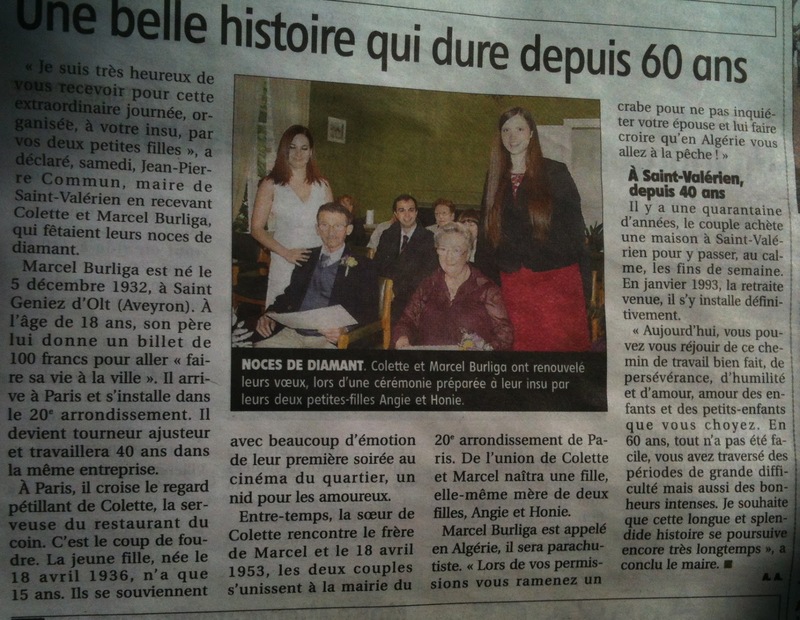 The women are all aged between eighteen and twenty-eight, and the men a couple of years older. Most of the stories seem to at least start and end in some part of Italy, although several feature excusions to France, the British Isles and around the Mediterranean. 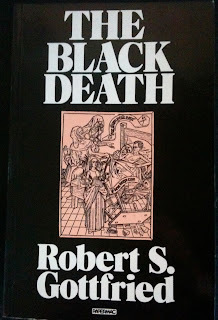 The Black Death itself is mentioned only in passing in the actual stories, but is mentioned in detail in the preamble to the book, and contains passages I have read elsewhere. 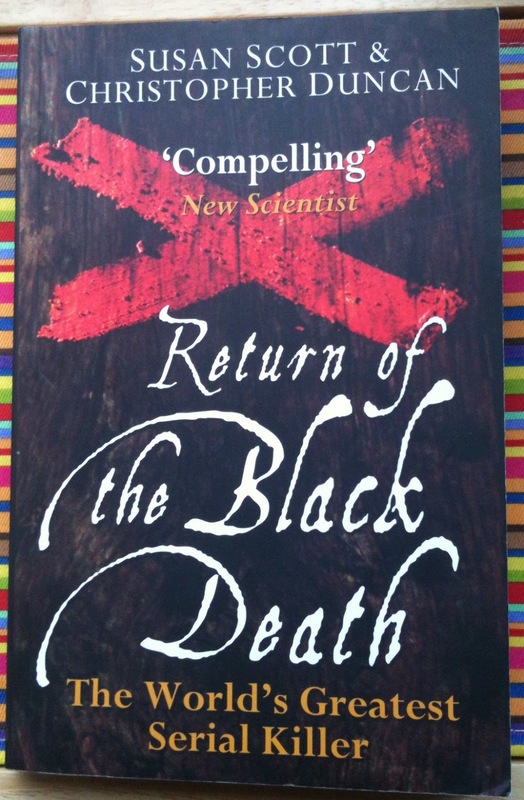 It seems to be a great source book on the social effect of the Black Death. Boccaccio's reaction was to escape, and having escaped, live life to the full with a devil-may-care attitude. I started my reading with the free John Payne translation on my Kindle, but soon swapped to the one by G.H. McWilliam was much more accessible. At the sum of £1.34 for over a 1000 pages it seems well worth it! The latest addition to the family, Hodmandod Majorette, has today successfully defended her PhD in Microbiology. Congratulations Angie! The Return of the Black Death slowly uncovers a scientific mystery. 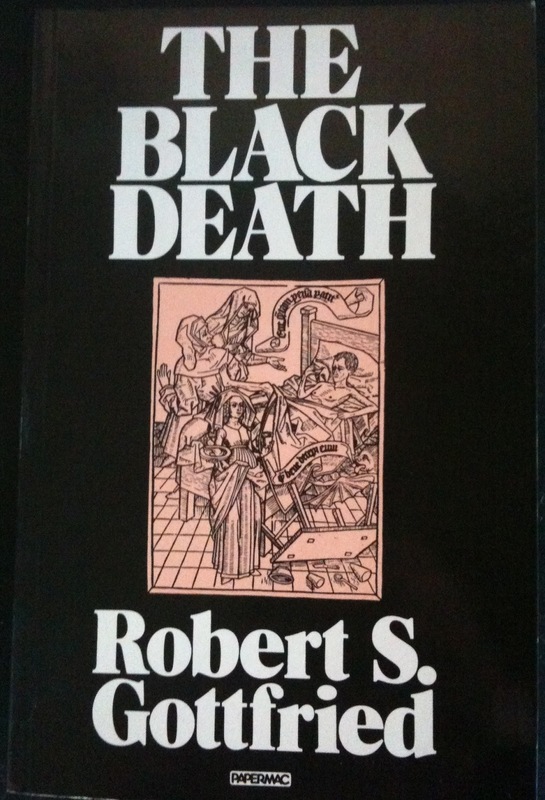 The two authors, Susan Scott and Christopher Duncan, have studied the Black Death for many years and have found many puzzling features which suggested to them that the commonly accepted idea that the plague was a fast acting bacterial infection reliant on rats and fleas was an incorrect one. Here, in summary, are some of these features. The book provides more detail and context. 1. The Black Death came to Sicily in 1347 and from there moved very quickly through Western Europe - 2,200 miles in three years. This was too fast for the disease to be spread just by rodents and therefore was spread by humans, which implies a long incubation period given the primitive and slow transport of the time. 2. It remained active during very cold winters and they provide evidence that in 1402 and 1494 it spread through the scattered communities of Iceland (but Black Rats only thrive in warm conditions, and the flea also needs warm conditions to breed). 3. It lasted 9 months in a village (they show how this indicates a long incubation period of 32 days (from time of infection to display of symptoms), and an infectious period of 27 days only the last 5 of which are with symptoms). Bubonic plague has much shorter periods than this (incubation period 2-6 days). 4. It had a death rate of around 50% which is too high for bubonic plage. 5. There were no accounts of dead rats which would be expected if it were bubonic plague since Black Rats are susceptible to bubonic plague and they are usually found first before a bubonic plague outbreak. Also, Europe uniquely has no native rodent population which is resistant to bubonic plage and would act as a reservoir - necessary for recurring epidemics. 4. After death the internal organs were showing necrosis (much evidence for this from symptoms - one of the first being the sweet smell of the air due to internal organs beginning to break down). This is not a feature of bubonic plague but is a feature of haemorrhagic fever viruses. 5. It remained active in France year on year when 'by all the rules of infectious diseases when the Black Death finished it should have disappeared'. This seems to have been the reservoir country - outbreaks in all other countries after the initial Black Death arose from the visits of strangers from 'far away'. Once it disappeared from France due to a cold spell then it disappeared from Europe for good since the reservoir was gone. 6. In Italy and elsewhere it was established that only a quarantine period of 40 days would guarantee safety from infection. This again supports the idea of a long incubation period. 7. It was generally acknowledged by everyone at the time that the disease was transmitted from person to person. 8. If the plague was really dependent on rats and fleas then establishing cordon sanitaire as they did in Eyam should have been ineffective since rats would have breeched it in summer - but it famously was. 9. It has been found that there is a mutation among Europeans which makes white blood cells resistant to being infected by HIV (one of the gateways into the cell, the CCR 5, is mutated). This mutation came about 2,000 years ago and was selected for an event 700 years ago i.e. the time of the Black Death. It is postulated that this mutation (CCR 5 - delta32) also guards against plague and therefore waves of plague have ensured this mutation's survival and increase in the population. It has been found in the descendent of one of the plague survivors at Eyam. The mutation is not found in non-Europeans - and it is only outside Europe that the bubonic plague has been rampant. I found it very convincing and very interesting. 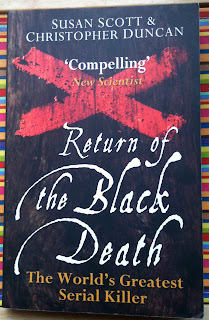 The last couple of chapters go on to describe that if the Black Death was viral rather than bacterial then we still cannot do anything to cure it. The best we could hope for would be to find a vaccination. I suppose this would be effective once it was found because, unlike influenza, the microorganism causing the plague was stable over 300 years - or at least its symptoms were. The paper gives references for each of these factors. In other words the Black Death was bubonic plague - a bacterial infection made more severe by various unfavourable factors of the time including the the climate, changes in the genetics of humans and their interactions with rats and fleas, and perhaps, most importantly other 'concurrent diseases' that I guess we may never know about. Before the Black Death struck the Eurasian land mass, human beings seemed to have been in a blessed state. They lived in small crowded communities that were isolated from each other and there were no infectious diseases. There had been the odd outbreak now and again - the Periclean plague in Athens in classical times, and then, during the time of the Byzantine Emperors another plague called the Justinian, but these fizzled out. They did not go global. The Black Death was different. It started somewhere in the plains of China and travelled along the Silk Road, its lethality depending on the way it struck: the bubonic form was the least lethal and tended to peak in the Autumn, if it went to the lungs (which it tended to do in a cold snap) then in was more lethal still and tended to prevail in the winter, and if it entered the blood then death was inevitable and could happen all year round. It came to the British Isles in around 1348. According to this book, this particular plague started because of climate change. Small burrowing infected rodents came south when the world went colder which caused them to collide with the migrations of humans also seeking out warmer and more luxuriant pastures. It brought to mind another plague I read about a few years ago: also caused by rodents coming to the surface and infecting men - this time through their droppings - the Hanta virus plague in Arizona. In the Black Death case it was a bacteria, the Yersinia Pestis. The Y Pestis lives in the intestinal tract of fleas, when there are too many of them they cause a blockage making the flea starve. The flea then seeks out more food (the rodent) and vomits what it swallows back onto its victim, and since this vomit consists of bacteria the rodent becomes infected too through breaks in the skin. The first indication of a plague then, was a sudden increase in dead rodents. Albert Camus mentions this in his novel, I remember, but few contemporary people made the connection at the time of the plague. Other animals were infected too, the only exception being the horse. The fleas don't like the smell of horse, apparently, and I remember reading somewhere that this may be why the nomads of the Steppe were not infected earlier. The proportion of the population that died varied. The book postulated that this variation was due to the links of a community with the outside. Places like East Anglia were badly affected because they were challenged with bacterial strains from the Low Countries (which seemed to have a particularly lethal strain) and also from London. Two chapters deal with the evidence of how many died, and soon I became a little punch drunk. In chapter 3 they died in the Mediterranean and the Middle East, in chapter 4 in northern Europe. Approximately around 25-50% of the population died. A chilling thought. People reacted in different ways. Some adopted an Epicurean stance, eating and drinking and roistering because who knows what tomorrow might bring. Others adopted a more temperate approach: the plague, after all, was a punishment from God. Others took a path in between. Then, in 1361 there was another plague - not quite as bad as the Black Death, but bad enough. Overall 20% died. Then, in 1369, another, and another and another, every 5-12 years. These tended to be less virulent but they came in frequent waves, each time sweeping away a percentage of the people, and it was the terror of this that some have said had the biggest impact. Overall, between 1349 and 1450 the population of Europe declined by 60-75%, the bulk from rural areas. The rest of the book deals with the effect of such a massive depopulation. I found this particularly fascinating. It caused, or considerably helped, to rid western Europe of the feudal system as labour became more rare and valued. In the towns there were innovations such as water mills and wind mills, gunpowder and printing (although I have also heard that these could also have come from China). It averted overpopulation and overcropping of the land. It turned people from mystical anti-intellectualism to reasoning, and in particular the development of the scientific method. Hospitals were divided into wards and changed from sanatoriums to places that could cure. Stripped of teachers, the universities had to start anew and establish new colleges to make up quickly for the shortage of staff. Fewer classically-trained teachers meant that England turned from Latin and French to English. After 1480 something shifted again, and the plague became a less frequent visitor, but by then there were other infectious diseases on the scene: in 1444 typhus, in 1426 flu, in 1485 the Picardy sweat, in 1495 syphilis together with 'red plague' (small pox), ague (malaria), measles, diphtheria and dysentary which were already familiar. The people that survived were more wealthy and the book ends musing over why this era also brought a lowering of fertility. 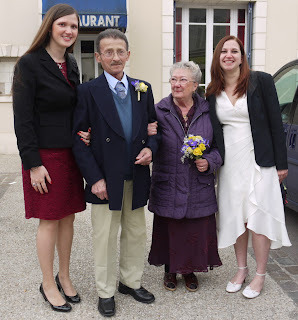 But given how the world must have been then - how uncertain and desperate - I think ti would have been reluctant to bring a child into the world too.